American Oystercatcher (Haematopus palliatus) SSC- A large, boldly-patterned bird, the American Oystercatcher is conspicuous along ocean shores and salt marshes. The American Oystercatcher is found on the Atlantic coast of North America from New England to northern Florida, where it is also found on the Gulf coast, and south to northern South America. True to its name, it is specialized in feeding on bivalves (oysters, clams, and mussels) and uses its brightly colored bill to get at them. The bird is uniquely marked by its black and white body and a long, thick orange beak. This shorebird is approximately 19 inches in length. Brown Pelican (Pelecanus occidentalis) SSC- The brown pelican is the smallest of the eight species of pelican, although it is a large bird in nearly every other regard. 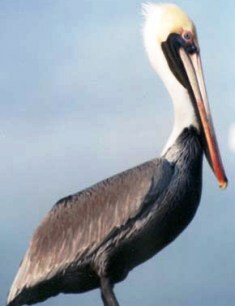 It is 42-54 inches in length, weighs from 6-12 lb and has a wingspan from6 to 8.2 ft. Brown pelican can be found on coasts in the Americas from Washington and Virginia south to northern Chile and the mouth of the Amazon River. After nesting, North American birds move in flocks further north along the coasts, returning to warmer waters for winter. Their young are hatched in broods of about 3, and eat around 150 lbs. of fish in the 8-10 month period they are cared for. Black Skimmer (Rynchops niger) SSC- In Florida, skimmers frequently occur inland, sometimes in large numbers, and have bred near Belle Grande in south.-central Florida and at Lake Okeechobee. 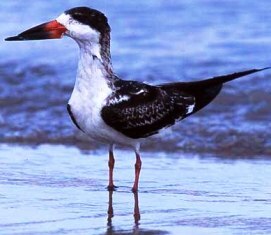 The remarkable bill of the Black Skimmer is sets it apart from all other American birds. The large red and black bill is knife-thin and the lower mandible is longer than the upper. The bird drags the lower bill through the water as it flies along, hoping to catch small fish. Black Skimmers are highly nocturnal. Although they can occasionally be seen foraging in the daytime the bulk of their feeding activities and chick provisioning takes place from dusk to dawn. Skimmers forage mainly in tidal waters of bays, estuaries and lagoons but also utilize rivers, and salt marsh pools, creeks, and ditches; such habitats tend to concentrate small fish. Least Tern (Sterna antillarum) Threatened- The smallest of American Terns, the Least Tern is found nesting on sandy beaches along the southern coasts of the United States and up the major river systems far into the interior of the continent. 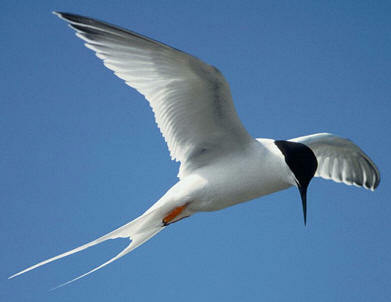 The least tern has a length of 8-9 inches with a wing span of 20 inches. This bird has a rapid wing beat and dives into the water for it's prey. The least tern is a diminutive tern with very short legs, a short forked tail and a smooth head with no crest. The yellow bill and legs, and white forehead of the adult Least Tern are distinctive at rest. Roseate Tern (Sterna dougalli) Threatened- A medium-sized tern similar in appearance to several other species, the Roseate Tern is primarily a tropical bird. It breeds across the globe in tropical oceans. The roseate tern is a medium sized tern like a gull like appearance. This bird is white with a black head. The roseate tern's tail is long and forked, and it's white wings contrast strongly with the black bill. Roseate Tern feed by plunge-diving for fish, almost invariably from the sea; it is much more marine than allied terns, only rarely visiting freshwater lagoons on the coast to bathe and not fishing in fresh water. it has also been known to steal fish from other birds. Limpkin (Aramus guarauna) SSC- The limpkin is a large unique marsh bird with a dark brown body with white streaks on it's neck, back, wings and breast. 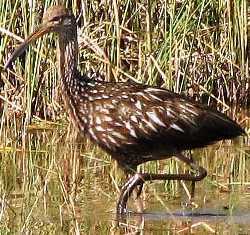 The limpkin feeds on freshwater snails, mussels, frogs, crustaceans and insects. This bird resides in both Florida and Georgia, where it can be found in wooded and brushy swamps marshes. The Limpkin is named for its limping-like flight with its dangling legs and jerky wing beats. The only species in its family, it is considered most closely related to rails and cranes. The limpkin was once very common in Florida, but due to the decline of its primary food source, the Florida Apple Snail, it is now listed as a species of special concern. Reddish Egret (Egretta rufescens) SSC- The Reddish Egret is a small heron bird. It is a resident breeder in Central America, The Bahamas, the Caribbean, the Gulf Coast of the United States, and Mexico. 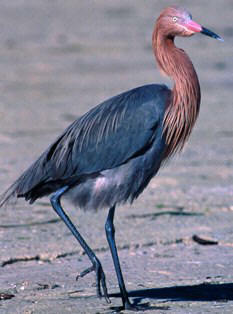 The reddish egret reach 27-32 inches in length, with a 46-49 inch wing span. It is a medium-sized, long-legged, long-necked heron with a long pointed pinkish bill with a black tip. The legs and feet are bluish-black. The sexes are similar, but there are two color variations. The adult dark morph has a slate blue body and reddish head and neck with shaggy plumes. The adult white morph has completely white body plumage. Young birds have a brown body, head, and neck.